I am leaving this morning from Larissa Station in Athens where trains depart for Larissa and beyond. According to the online booking system the 10.18 am train has no first class seats for the journey to Thessaloniki but there is a seat to Larissa. I will buy that ticket then continue on the fast suburban train to my destination. The booking office does not take credit cards and I stuff up at the money machine choosing New Zealand dollars instead of Euros. No, no, no, I shout as I realised my non-reversible mistake. I pay an expensive exchange rate penalty. So deflating. On the platform I am enveloped in cigarette smoke as people wait. Want to check bag. Can’t to Larissa. An announcement in Greek I don’t understand. People are boarding a train. The platform is nearly deserted. What train is that? Is that my train? Yes it is. Hurry. It’s leaving in just minutes. Oh good, I have a window seat facing forward in a six-seat compartment. A young family from Poland comes in and the guy hoists my bag into the overhead rack for me. The train drags itself out of the station gradually picking up speed and the comforting rhythm sets in. Suburbs give way to villages and towns. 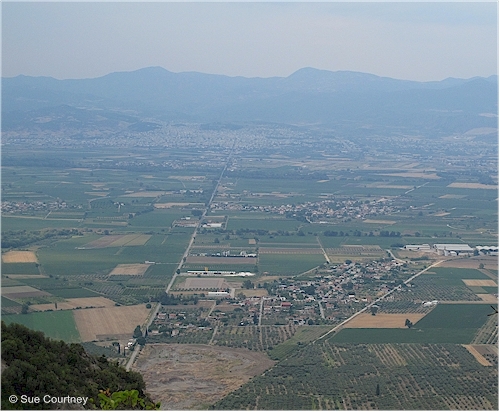 Horticulture on the plains is diverse with new vineyard plantings around Oinoi – sounds very similar to oinos, one of the Greek words for wine. Indian workers are working in more established vineyards, presumabley shoot thinning. I reflect on the reason I’m going north the slow way. It’s to take the journey my father did. After becoming a POW my father was transported north by train. On his arrival in Greece, several weeks earlier, he was in the truck convoy on the road. I followed the road route in 2013. Now I am riding the tracks before part of the route becomes part of Greece’s history. I’m on the lookout for Brallos Station. My train will not stop here and I am not sure what side the station is on. In 1941 Brallos Station was know as Gravia Station. 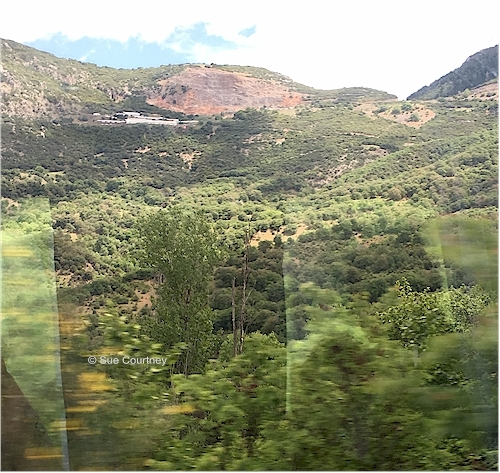 The railway viaducts just north of here had been bombed during the battle so the POWs had to detrain for a torturous walk over the mountainous Brallos Pass to the station that serves Lamia at Leianokladi, a road journey of some 41 kilometres (25 miles). Neil and I drove the Brallos Pass route in 2013. The north side of the pass road is now sometimes used as a Rally of Greece stage. It reminded me a little of NZ’s Takaka Hill. 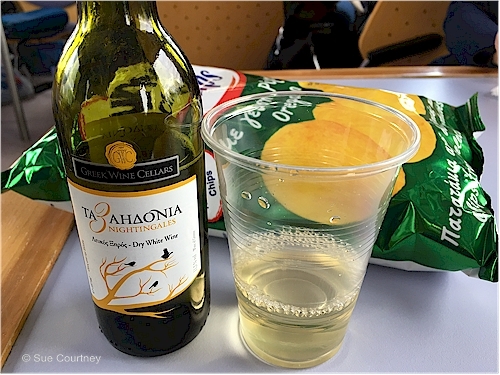 For lunch I buy some crisps and a bottle of wine to toast my Dad and stay in the restaurant car where there are panoramic windows both sides of the carriage. My phone GPS says we are closing in on Brallos but I must be looking out the wrong window because we start the climb and enter the first tunnel after miles and miles of plains. We are circumnavigating the mountainous pass. I see the quarry above me, it’s a scar on the landscape. I see the road that traverses below the escarpment and where the hairpin bend is to Skanmos. I take photos of where I took photos from 3 years before. More tunnels, more viaducts spanning rocky crags, then I see the ‘beeline’ road to Lamia. The soldiers called it the beeline because it’s so straight. We are high above it and while it looks parallel to the train there is still more mountain clinging to do before we get to the same level. After what seems like many minutes later I look back and see the railway bridge I photographed from the ‘beeline’ three years before and the old road zigzagging down the hill. 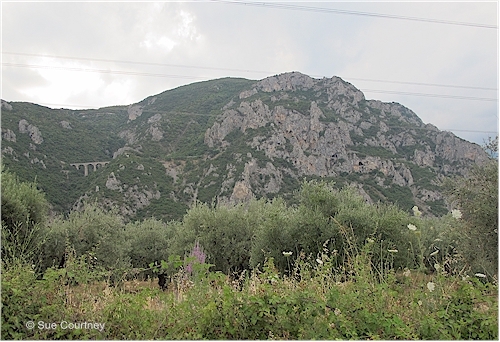 Standing on the ‘beeline’ road to Lamia looking back up at the hills flanking the Brallos Pass with railway viaduct clearly visible. Photo July 2013. It is still some distance to Leionokladi where the POWs boarded their train to Thessaloniki. The railway line from here to Domokos is fascinating. It’s like the middle of NZ’s North Island main trunk line with many long curves, just no spiral. We are travelling slowly now. From time to time I see glimpses of the new line emerging out of tunnels that will replace this section of the railway route. It was meant to be open already. I am glad it isn’t. At Domokos the diesel engine is replaced with an electric one and we zip along the line to Larissa where I change trains. Larissa to Thessaloniki is 1.5 hour journey. I am so looking forward to the Valley of Tempe but we disappear into a tunnel and emerge beyond the valley some several minutes later. Soon the Aegean Sea is on my right and towering Mt Olympus is on my left. After Katerini, where I lost my cell phone in 2013, I doze off for a while. 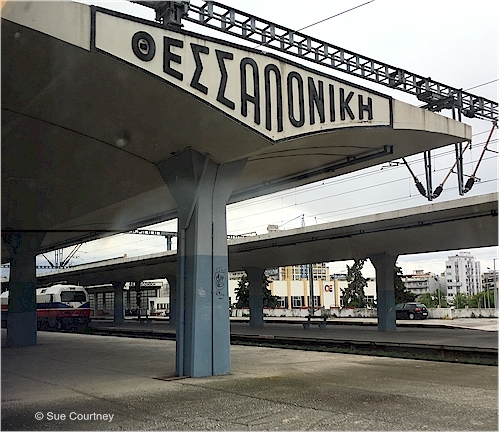 Six hours after I leave Athens, I arrive at Thessaloniki Station. I am booked in at Le Palace Art for the next three nights. This entry was posted in Greece, Travel and tagged 1941, Athens, Brallos Pass, POW, Thessaloniki by Sue Courtney. Bookmark the permalink.